Linda Aksomitis presenting a session on ebook publishing at TBEX Stockholm for travel bloggers. Conferences are a great place to get new ideas and tips, no matter what you do, from well drilling to computer programming. 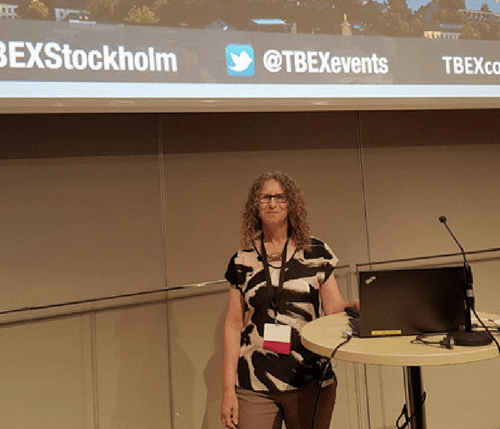 In 2016, I was thrilled to be a presenter at all three of the TBEX (Travel Bloggers Exchange) travel blogging conferences: Bloomington, Minnesota; Stockholm, Sweden; and Manila, Philippines. All of my presentations focused on ebook publishing tips, from creation through to marketing, and the last one, a five-hour workshop where we covered it all and did some basic formatting in class. Since I teach the online course, Publish and Sell Your Ebooks, where I guide students through the whole epublishing process, I already had a lot of resources for the various computer operating systems and types of software. I’ve included the slideshows below, for a concise look at the process of creating ebooks for your content marketing, or for a passive income stream by selling them. You’ve probably noticed that many of the most popular blogs are giving away ebooks these days. I know I’ve downloaded a number of great free resources from my favorite social media writers. This slideshow takes you through the ways that you can use an ebook in your content marketing. Plus, it provides an overview of your options in ebook creation. The simplest type of ebook to make and share from your blog — whether you’re a travel blogger, like the TBEX participants, or blogging on some other topic — is a PDF. However, if you want a “real” ebook that looks great on dedicated e-reading and mobile devices, then you’ll need to dive into creating a specially formatted ebook. This slideshare walks you through the steps to creating an ebook. If you’ve decided that an ebook would be great content marketing for your blog, or if you’d like to get some books on the virtual bookshelves at Amazon (#1 ebook retailer) or Apple (#2 ebook retailer), I can help! My course, Publish and Sell Your Ebooks, is offered around the world through community colleges and libraries. A new section providing ebook publishing tips starts in the middle of every month. Click here to learn more.